Hiway Stabilizers’ work on the Hornsby Junction Remodelling Project not only resulted in a sustainable solution for the rail corridor, it also won the firm a top industry award. At the 2018 AustStab Awards of Excellence, numerous innovators and leaders within Australia’s stabilisation sector were honoured for their achievements over the past year. The annual awards covered off a range of project and professionals making waves in the industry, including Hiway Stabilizers’ work on the Hornsby Junction Remodelling Project in northern Sydney at Hornsby, which won the 2018 Excellence in Sustainability award. Just what was involved in this innovative rail project? The Hornsby Junction is the network of interconnected tracks located between the Pacific Highway and Bridge Road, Hornsby. The junction is heavily used by both passenger and freight rail services and is where the T1 Northern Line and T1 North Shore Line meet. Hiway Stabilizers was contracted by the client – the Novo Rail Alliance – to undertake the works, which began in May 2017. Upgrading Hornsby Junction will provide long-term benefit to the community by delivering faster turnaround times for trains and increased capacity and reliability for the T1 North Shore Line. The conventional subgrade treatment methodology, as per the guidelines, involved the removal of existing subgrade and replacing with suitable imported select fill material that met the structural capacity requirements for rail. During early discussions in mid-2016 with Novo Rail, the option to modify the existing subgrade in-situ was explored. It was considered to be a more sustainable solution, which would have significant advantages while delivering a more structurally robust and cheaper option than the conventional subgrade treatment. In addition, a triple bottom line assessment would show that it would be superior in all aspects and a desirable model for future rail subgrade works. This decision eliminated the need to remove material (classified as contaminated) to regulated landfill and replace with 2000 tonnes of select material. It also substantially reduced truck haulage movements on already heavily trafficked adjacent road networks of the highly urbanised location in the Hornsby city centre. In addition to the physical construction, Hiway Stabilizers’ scope included initial assessment of site samples and borehole logs, coordinating further sample collection and laboratory analysis, final mix design testing and mechanistic analysis to determine the appropriate design to be implemented on site. Hiway’s undertook a detailed design as per the project specifications to ensure requirements specified by Novo Rail were met. Design testing included lime demand, CBR, 7-day and 28-day UCS, Atterberg Limits, absorption, swell, capillary rise, pH, sulphate and organic matter testing to comply with the stringent conditions set out in the project specification. 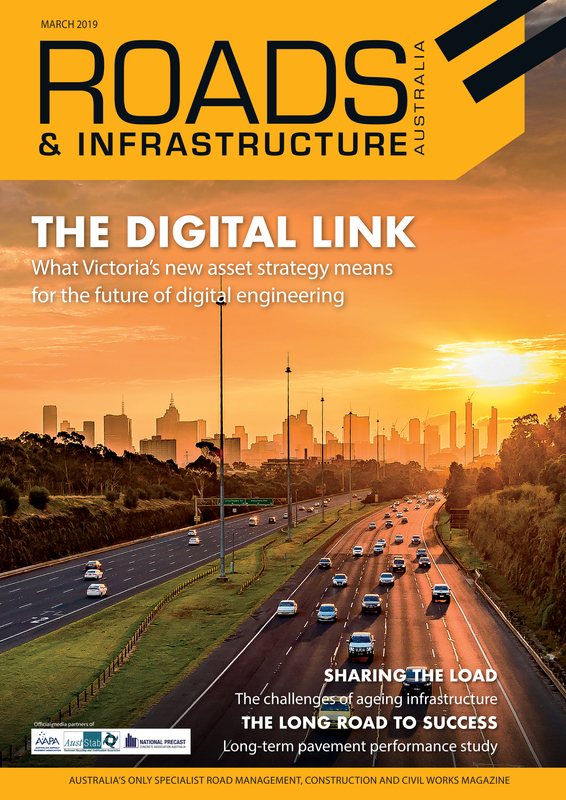 Utilising this information, the contractor used the typical rail design model undertaking back calculations in Circly to determine appropriate design loadings. From this, the contractor determined the depth of treatment required assuming the design strength characteristics were achieved. An examination of the materials to be stabilised comprising mostly gravelly and sandy clays led to a decision to propose hydrated lime and cement stabilisation as the preferred treatment to achieve the client’s specified outcomes. A detailed design report was then prepared and submitted to the client for approval recommending stabilisation to a depth of 300 millimetres using three per cent hydrated lime and 1.5 per cent cement within the live rail corridor at Hornsby Junction. Hydrated lime was recommended over quicklime as the slaking activity may have impacted train movements and visibility. A triple bottom line assessment of the project confirmed the decision to stabilise the subgrade not only made good sense but, by assessment, was the most sustainable solution. • Construction plant remained onsite with no vehicles entering or leaving the site, thereby eliminating the need to continually clean the roads and footpaths. • Reduced noise pollution by eliminating excavation and trucking. Hiway Stabilizers’ analysis of the project showed that for all areas, except for CO2 emissions, the in-situ stabilisation process was more beneficial than the ‘remove and replace’ methodology. The analysis of the project made quantitative assessments of environmental and economic performance and only qualitative assessment of social performance. The CO2 emissions are driven by the cement and lime production component being significant and not outweighed by the emissions from the additional operations in the remove and replace stage. Alternative binders to replace the cement component with a lower CO2 footprint were not considered at the time of design. However, subsequently investigation has been carried out on a number of alternative binders. If a slag / lime / flyash blend had been used then the CO2 emissions would have been substantially reduced. As a result of the project, the firm has developed a tool to assess future projects to deliver improved sustainability outcomes and guide sustainable procurement and design. 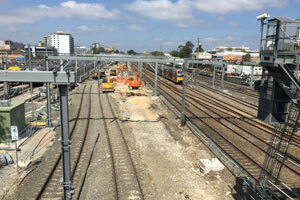 The project site was located in a highly urbanised environment and the stabilisation was within the live rail corridor. This meant that site access and access times were restricted for deliveries of plant, water and additive materials requiring close coordination with the client’s team. To reduce road traffic impacts and construction time in the rail corridor, Hiway’s proposed to the client that a blend of lime and cement, in the same proportions as the approved mix design, be used. Hiway’s utilised two spreader trucks which ensured a full bulk tanker load of additive could be emptied and transported onto site for spreading within each window of opportunity to cross the tracks (prior to 6:00am, three hours around midday and after 6:30pm). 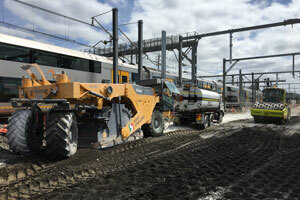 The contractor also utilised two water trucks, one to transport water to the site and pump underneath the live rail lines and one to receive the water and remain onsite with the stabilising operation. Spotters were used and spreading of binder adjacent to live rail lines was halted while trains were approaching. The use of lime and cement blend stabilisation as an alternative to a conventional methodology proved to be a cost and time effective solution with significant advantages for the client and the community. The project was completed in October 2017 within the client’s scheduled timeframes and to the specified quality and design requirements with minimal impact on routine rail operations and local traffic.